The mass spectrometer expression CMS provides essential information quickly and improves the chemist’s workflow. Modern organic labs have become automated, yet real-time mass assays remain just out of reach using conventional LC/MS systems. 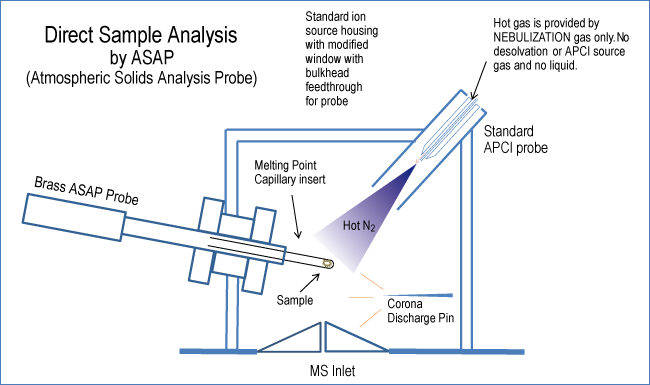 The direct analysis probe, otherwise known as ASAP® (Atmospheric Solids Analysis Probe) permits chemists affordable and reliable sample analysis of solid and liquid samples such as reaction mixtures, food samples, natural products and tablets. Chemists dip the closed end of the capillary into the sample of interest (even complex mixtures) or scrape the surface of a solid, and then place the capillary into the CMS for analysis. Clean-up and analysis is a single step. Involatile buffers and salts remain on the capillary ensuring they do not suppress ionization or interfere with the measurement, while the compounds of interest are identified by the CMS.